still going through photos for living room inspiration. I love this chair and pillow! might just have to do this same exact thing by our fireplace! 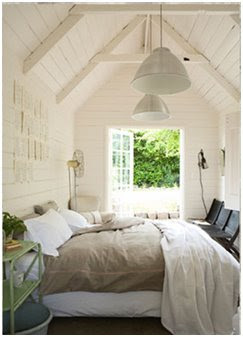 I love the whole relaxed casual feel of this room, definitely what I am going for! I love any piece of furniture that has the paint chipping off! 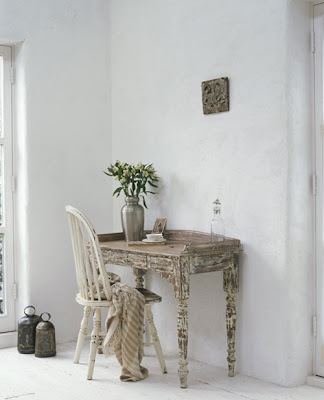 and this is my inspiration picture for the white painted walls! If money grew on trees I would do hardwoods in there. and be quite comfortable in this chair next to the fire! I am on the hunt for a pedestal coffee table like this. at a thrift store for $30.00! All it needed was a little paint! This is the sectional I want to get. and would be so kind as to leave a comment for my husband? His name is Chris, sometimes referred to as Honey. melaine!! I seriously can't wait to see what you do! Ya know i love white too..I think i might bring it into by bedroom..the bed in your post is so great looking..I can't wait to see how your living area turns out!Have you done anything yet? no pressure..lol thats one thing about posting it kinda makes you feel inspired AND pressured...Oh to be creative hey? It is so exciting! Hi-I look at your blog everyday and love everything-(HONEY) please let her get the ikea couch -my sister has one and with two kids and dog it's great! also it's easy on the wallet-go to ikea and sit on in it you'll love it!!! 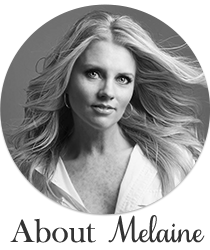 hey Melaine, it's funny that you are looking for a round ped-coffee table because i am selling our antique one. i don't want to but we just don't have the room for it in this house. we down sized going from 2500 sqft to 1400 sqft!!! i seriously need to find a garden center that has those "money trees"
My husband also refuses to buy furniture from Ikea. Everytime I drag him there and have him sit on Ektorp couch he just says NOPE!! He tells me that we should spend a few extra bucks and get a better quality one. I want to put it in a room that never gets used. I hate when they have opinions. I finished the Twilight series a couple months back. I LOVED IT. Yes, I'm 40 years old and I couldn't put it down. We have that couch and love it!! We've had it for a little over a year and it is great! Super comfy, stands up to my five year old jumps, and the slipcovers come beautifully clean when you wash them. All that, plus it is about $1500 cheaper then the one at PB makes me love it more every day!! I don't have the sofa, but I do have the chair. I love it! My mom does too, every time she comes over to watch my little guy she likes to kick it in that chair & goes on & on about how comfy it is. I am not just saying that so you honey will let you buy it either. :) I also have 2 crazy Labs, 2 cats & one crazy 6 yo & the chair is still doing well. I have the white slip cover. my best friend just got a sofa from Ikea and she loves it. Also, she picked up an extra slipcover for it for $11.00!! I have sat on it and it is so comfortable. Plus, you just can not beat the price. I can't keep a white shirt clean for 5 minutes. 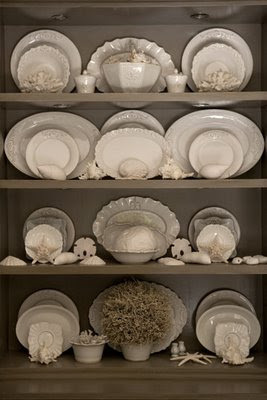 I wonder what I'd do to a white room with white furniture. It looks so elegant here, though. Love it all, it is going to be wonderful. That sectional is my favorite! My husband and I both want it so bad. Our friends have it...it's been through a lot of use and has lasted well. I am so excited to see what you do. I'm sure it will be nothing short of amazing! Love all your inspirations ideas! 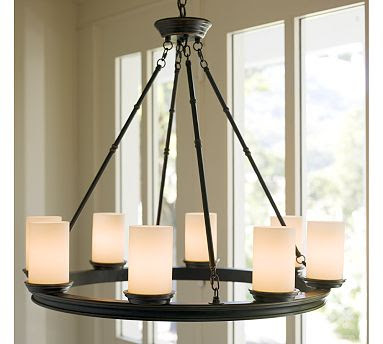 Have you seen the new Restoration Hardware catalog for fall? If not you should check out the website- lots of that look in it! Also wanted to let you know I have a sectional just like that in my sunroom from JCPenney.com and it is super comfy and very afforable. Can't wait to see your finished product! 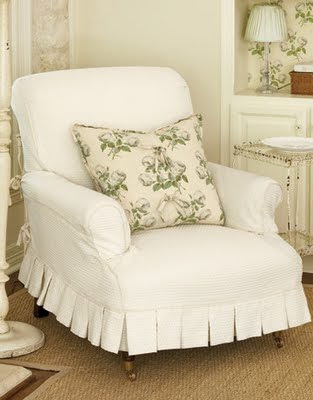 That burlap, ruffled ottoman...oh boy. It's a beaut. And I also have the chippy paint affliction you speak of... As far as I know, there is no known cure. Is that the Ektorp sectional? I want that for our basement family room. We're planning to get the regular sofa for our living room in the near future. I can't wait! Love the inspiration rooms!! 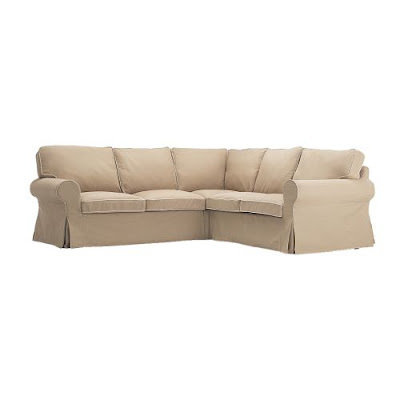 You should send 'Honey' over to 'Just Beachy', she loves her Ikea sofas and chair and they are from the same family as the sectional. 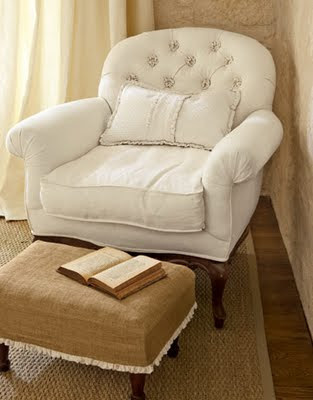 You can slipcover it and it is so comfy and easy care in light colors....tell him, really!! Hi I have a coffeetable similar to the one in your blog pic. If you are interested I can send you pics and dimensions. My email is [email protected] You can also go to my website www.petitemaisonhome.com the coffeetable is not pictured, but the site is still fun. OH i can't wait to see what you do:) I know it will be beautiful!! You sure have the talent and if you happen to find the money tree let me know. Hi, Look on Craig's List right now under "free" U District, you'll find your pedestal coffee table - free, but you'll probably have to take the 2 hideous chairs with it, but still a bargain !!! Hi, It's me Lisa again about the Craig's List ad for the pedestal coffee table that is free. I got the phone# for you to call about it. It is 425-466-0707. I hope you can get it in time. They say they'll donate all by this coming Tuesday. Enjoy your blog! Wanted to let you know that there is a very cute sectional like this at Sams club right now for $950. A good friend of mine who has an AMAZING home and spends lots of time and money decorating it just sold me her $3000 sofa (for $450! )because she replaced it with this sectional from Sams. I guess it is super comfy and she loves it. Might check it out! Melaine, go get your husband right now!! I bought my Ektorp sofas 7 years ago and absolutely love them!! Even with four active children and lots of abuse, they are coming through absolutely fine!! We are going on our second set of covers, and I love the fact that I can just throw them in the wash and I'll have a super clean sofa. Actually I made a post recently about them (and about a swedish website that makes custom covers in incredible fabrics...). As for the coffee table, just find a regular pedestal dining room table and cut the pedestal to size... I have a kitchen table in my living room to which I shortened the legs. Good luck!! Chris aka Honey...we have the Ektorp sofa and chair. They are great. They wash up well and you can't beat the price. Come on over and have a seat and check it out! Would love to see ya! We have two Ektorp couches ( white) and an Ektorp chair from Ikea. I LOVE them!! You would NOT be disapointed in these couches. An added bonus is that you can change out the slipcovers. They have a great white, beige and a vintage-y floral. I have the Pottery Barn basic sectional. I have been happy with it for over a year. My husband and 2 labs are hard on everything! Take Honey to Ikea and Pottery Barn and let him decide. 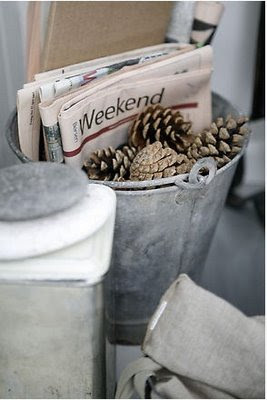 Have that same bucket - love it for clothespins! =) Love all the white!! So soothing. These area all gorgeous inspiration pictures. 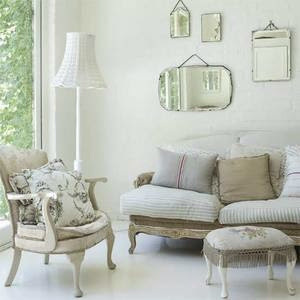 I have adored that linen chair and slipcovered ottoman for quite awhile now!!! I have an ikea couch that won't die, the couch is the greatest. I wanted to buy the equivalent of this IKEA sofa (i.e. the 2 seater). I instead bought something very expensive from another store and lived to regret it - it is so uncomfortable whereas the IKEA is comfortable and you can wash the slipcovers (or dye them, get different ones etc.) - tell your husband that they're cheaper too. I have been in love with that house with the beautiful tufted and slipcovered chairs ever since I saw it in a magazine, I also kept the pic's for inspiration. Now for the slipcovered couch from Ikea, I have the couch and love seat and I have to tell you I LOVE them, you could never get a slipcovered couch for that price anywhere else!! I forgot to tell you I have been searching for a coffee table like that and I can't find one anywhere, I guess they must be hard to come by. I even thought of cutting down my kitchen table to make it coffee table heighth and then getting a new dining table,we'll see, I haven't done it yet!! Cool sofa! I bought a chaise lounge from Ikea (I fell deeply in love with it--the karlstad--and wanted an area to read and mellow out in). It is surprisingly well made. Probably like your husband I was skeptical about the lower prices and mass production, but I am now a convert. I love my chair and it is soo comfy. Good luck! I actually do have an Ektorp sofa from Ikea. We have had it for 14 years and it is still going strong. I love being able to pull all the slipcovers off and washing them. I'm going to buy a second one for another room in the house as soon as I can sell the furniture currently there! I love all the pictures and would purchase every one of those chairs if I could! 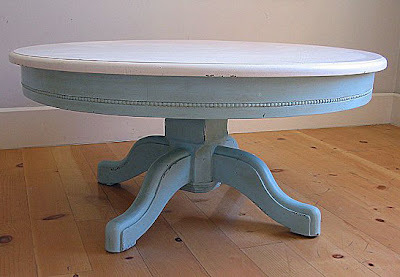 Oh, and the round coffee table - I cut down my round kitchen table to the right height and it works perfectly! Sometimes they are easier to find and it was easy to do. Good luck! BH boys had an ottoman with the tan canvas around it a few sales ago. Bet they have it again! It would look great in your new room! I am totally surprised that Chris from Just Beachy hasn't left a comment...she totally is devoted to her Ikea sofa with washable slipcovers!And I totally am a convert like Maisy...my 23 year old daughter introduced me to Twilight...and I have my own "romance reading"nook...S. Meyer, J. Austen, etc. Such an inspiring post!! Get the best Modern Living Room Furniture India with particular emphasis on designs from mid-century through contemporary designs from the early 21st century at theurbandecor.com.This is the best Online Store for Modern Furniture. which has huge collections of furniture. Get the best in School Furniture,Library Furniture, School Furniture Manufacturer, College Furniture, Nursery Furniture in Mumbai, India from Hycon Industries. Suppliers of affordable furniture - stands, trolleys, chairs, bunk beds. Visit Hycon factory outlet today.